Sweet Spring where are you? 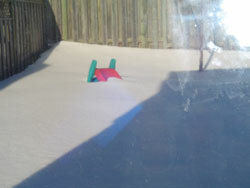 Here’s my backyard – not much hope for Spring yet. For Christmas I got a subscription to the beloved magazine Interweave. I just received the spring issue and immediately found several patterns I want to make. Of course I’ll probably only be able to make one sweater or end up in the poor house. I can’t wait for Spring to arrive. I’m tired of the frigid temperatures and mountains of snow. Some of my pattern choices from Interweave include: Flutter Sleeve Cardigan and Frock Camisole. Oh and the leg warmers they are featuring would be a great challenge. They are so beautiful, not like the icky leg warmers I wore as a teen in the ’80s. 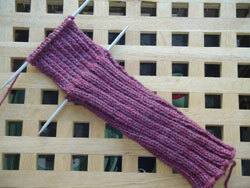 Here’s the status of my ribbed socks. The first one is done and now I’m on the heel. When I’m not wearing the sock it looks rather funny – it’s long and skinny – it reminds me of the stockings in How the Grinch Stole Christmas. 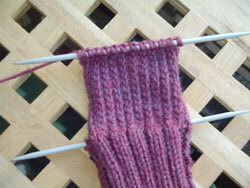 The lovely reinforced heel fooling me into believing that maybe, just maybe this sock will never get any holes in it. Sock number one patiently waits for it’s partner.